Haq's Musings: Thick Smog in Delhi and Lahore: Is India Crop Burning to Blame? 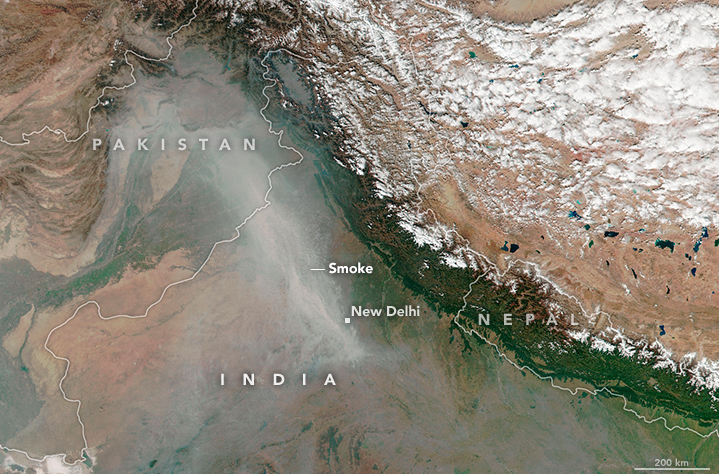 Pakistani officials have blamed "the incursion of smoke and particle matter from the burning of crop stubble in the Indian Punjab." Particulate matter of 2.5 microns or larger as measured in micrograms per cubic meter is up to 80 times higher than the upper limit of 10 micrograms per cubic meter considered safe by the World Health Organization. Is the Pakistani claim supported by data? Let's try and answer this question with satellite images of the area released by the United States' National Aeronautics and Space Administration (NASA). "In early October 2016, Earth-observing satellites began to detect small fires in Punjab, and the number of fires increased rapidly in the following weeks. By November, thousands of fires burned across the state, and a thick pall of smoke hovered over India. The Visible Infrared Imaging Radiometer Suite (VIIRS) on the Suomi NPP satellite captured a natural color image on November 2, 2016. The map (second image) shows the locations of the fires VIIRS also detected." 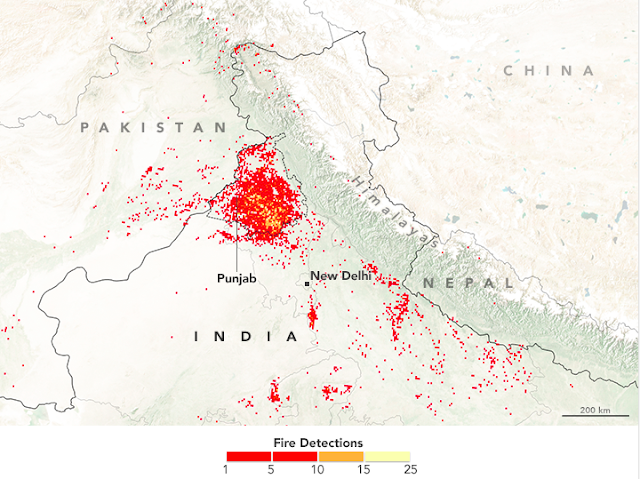 This year, 2,620 incidents of crop fire were spotted via satellite in Indian Punjab. In Pakistan, the number was limited to just 27, according to Indian media reports. Indian reports confirm that Pakistan has done a good job of cracking down on incidents of crop burning to dramatically reduce them. Low wind speeds of less than 2 meters per second and reversal of wind direction from east to west are causing crop burning smoke to drift from Indian Punjab toward Pakistan, according to an Indian Meteorological Department official as quoted by the Wall Street Journal. "The haze visible in this image likely results from a combination of agricultural fires, urban and industrial pollution, and a regional temperature inversion. Most of the time, air higher in the atmosphere is cooler than air near the planet’s surface, and this configuration allows warm air to rise from the ground and disperse pollutants. In the wintertime, however, cold air frequently settles over northern India, trapping warmer air underneath. 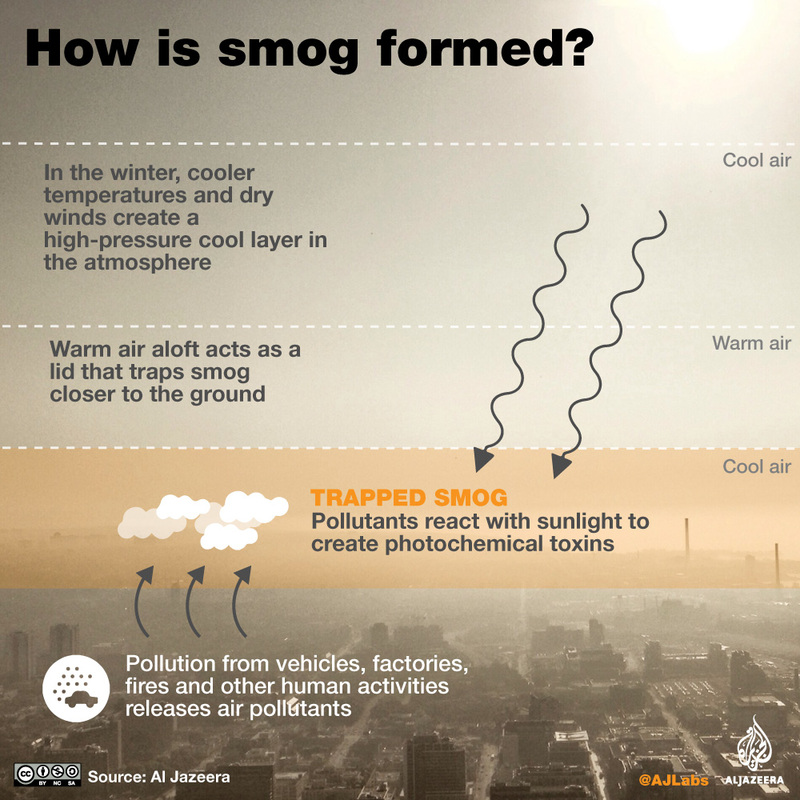 The temperature inversion traps pollutants along with warm air at the surface, contributing to the buildup of haze." 1. Crack down on crop burning to clear fields. 2. Reduce the use of solid fuels such as cow dung, wood and coal to limit particulate matter released into the atmosphere. 3. Impose higher emission standards on industries and vehicles through regulations. 4. Increase forest cover by planting more trees. 5. Encourage the use of more renewable energy sources such as solar, wind, hydro, etc. The cost of acting now may seem high but it will turn out out to be a lot more expensive to deal with extraordinary disease burdens resulting from rising air pollution. Movement of pollutants does not recognize national borders. It has severe consequences for both India and Pakistan. The only way to deal with it is for the two nations to cooperate to minimize this problem. South Asia accounts for more than a third of all PM2.5 pollution related deaths in the world. The sources of particulate pollution range from solid fuel burning to crop clearing fires and use of dirty fuels in vehicles and industries. Recognition of the growing problem is urgent. Failure to act could be very costly in terms of human health. It's a good idea to "Reduce the use of solid fuels such as cow dung, wood and coal to limit particulate matter released into the atmosphere"
1) The economics of solar are unbelievable, but the biggest problem is unreliable panels. 2) solar cooker can be an interesting item for villagers to use. 3) solar water pumping is working out great. While Delhi’s air quality has generated headlines worldwide in recent days, experts say the air in Lahore rivals the Indian capital’s for toxicity. The problem is not limited to the city; in 2015, according to a World Health Organization estimate, almost 60,000 Pakistanis died from the high level of fine particles in the air, one of the world’s highest death tolls from air pollution. For years, Pakistani environmentalists have referred to November, when crop burning, higher emissions and cold weather combine to blanket Lahore and the rest of Punjab Province with acrid smog, as a “fifth season.” As in India, which Punjab borders, the problem seems to have been getting worse, and this month it has reached what many Pakistanis are calling a crisis point. Naseem-ur-Rehman, a director at Punjab’s Environment Protection Department, admitted that the government had bought six air-quality monitors last year but never installed them — until last week, when a public outcry over the lack of data led to a scramble to set them up across Lahore. He said the department was “closely monitoring the situation,” but as of Thursday it was still not releasing air-quality numbers. “This is a crisis of data,” said Ahmad Rafay Alam, an environmental lawyer and activist in Lahore. He said six meters were insufficient for a city the size of Lahore, let alone for all of Punjab. In the absence of official information, some Pakistanis have taken matters into their own hands. One is Mr. Omar, who installed air monitors in Lahore, Islamabad, Peshawar and Karachi, where he lives. He has set up Twitter accounts to post the readings in real time. Mr. Omar was inspired by his experience living in Beijing, where the American Embassy changed the debate about pollution years ago by publishing air-quality readings on Twitter. The Chinese authorities were ultimately prompted to set up dozens of air monitoring stations in the capital and across China. Thirteen power plants that run on fuel oil have been shut down since last weekend, and power generation has been cut back at four others, leading to daily outages of more than 12 hours in many urban areas. At one Lahore hospital alone, more than 500 people have been arriving daily with complaints of respiratory difficulties and eye irritation. “Lahore looks like a dystopian wasteland right now, kind of like a scene from ‘Blade Runner,’” said Adil Ghazi, a business owner. The Punjab government says it has taken several emergency measures, including a ban on burning crops and solid waste. It says that more than 100 people have been arrested for crop burning and that hundreds of factories have been shut down for not having proper emission-control equipment. The Lahore traffic police say that they have collected more than $50,000 in fines in recent days from drivers whose vehicles did not meet emissions standards and that two centers have been set up for checking commercial vehicles for compliance. or by animals or animal-driven implements. Animals used in these operations are mostly bullocks, male buffalo, and camels. both urban and rural areas for service and maintenance on tractors, tube wells, and other farm machines and equipment. and land preparation, resulting in higher yields. India accounts for seven of the world's 10 cities with the worst air pollution, according to a new report, but previously smogbound Chinese cities have seen a marked improvement. Gurugram, a suburb of the Indian capital New Delhi, is the world's most polluted city, according to Greenpeace and AirVisual, which found it had an average air quality index of 135.8 in 2018 -- almost three times the level which the US Environmental Protection Agency regards as healthy. In two months of last year, the AQI in Gurugram -- as measured by levels of fine particulate matter known as PM 2.5 -- was above 200. The EPA regards this as "very unhealthy" and warns that "everyone may experience more serious health effects" if exposed. "Air pollution steals our livelihoods and our futures," said Yeb Sano, executive director of Greenpeace Southeast Asia. "In addition to human lives lost, there's an estimated global cost of 225 billion dollars in lost labor, and trillions in medical costs. This has enormous impacts, on our health and on our wallets." The problem is particularly pronounced in South Asia. Eighteen of the world's top 20 most polluted cities are in India, Pakistan or Bangladesh, including the major population centers of Lahore, Delhi and Dhaka, which placed 10th, 11th and 17th respectively last year. Climate change "is making the effects of air pollution worse by changing atmospheric conditions and amplifying forest fires," the report said, while noting that the key driver of global warming, burning fossil fuels, is also a major cause of dirty air. "What is clear is that the common culprit across the globe is the burning of fossil fuels -- coal, oil and gas -- worsened by the cutting down of our forests," Sano said. "What we need to see is our leaders thinking seriously about our health and the climate by looking at a fair transition out of fossil fuels while telling us clearly the level of our air quality, so that steps can be taken to tackle this health and climate crisis." While South Asian countries, along with China, are the worst affected, air pollution is a global issue. Of the 3,000 cities measured in the report, 64% exceeded the World Health Organization's annual exposure guidelines for PM2.5. PM2.5 includes pollutants such as sulfate, nitrates and black carbon, which can sneak deep into the lungs and cardiovascular system. Exposure to such particles has been linked to lung and heart disorders, and can impair cognitive and immune functions. Every single city included in the report in the Middle East and Africa exceeded WHO guidelines for PM2.5, as did 99% of cities in South Asia, 95% in Southeast Asia, and 89% in East Asia. "As many areas lack up-to-date public air quality information and are for this reason not represented in this report, the total number of cities exceeding the WHO PM2.5 threshold is expected to be far higher," the report warned. One bright spot was China, once the world's poster child for urban air pollution. The report found that average concentrations of pollutants fell in Chinese cities by 12% from 2017 to 2018, while the capital Beijing has fallen out of the top 100 most polluted cities following concerted efforts to get air pollution under control.